For one of my classes this year, I've been experimenting with a homework blog. It is a central location where I can post the homework and all the students can access it. I like to have them watch native speaker videos or read news articles, and I'll often post questions to help focus their listening or reading. Normally, I post the homework the day of class and tell them, and then I send the link with my weekly course email (which also includes the Xournal PDF notes from the discussion and the date and time of the next class meeting reminder). The teacher who had this class before me said that the students hardly ever did the homework, so she gave up. They almost always do the homework for me...I'm not sure if it's this site, if I give better homework, if I'm just a better teacher (just kidding! ), or if they don't know me well enough to risk not doing it...The point is that they usually do the homework. I usually try to integrate the homework into the class discussion somehow, but I don't rely on it being done. If there is an internet outage, a blog failure or a busy week, I can't not have class. That said, I also think it is kinda dumb to give unrelated homework, and I feel like a bad teacher when I don't discuss the homework in class, somehow. A page with all the course info—notes, review, etc. class dates, syllabus, etc. My Uni teachers did something like this with the school blackboard system, but I think that system was a lot less comprehensible and user friendly. Has anyone else tried this before? Any suggestions or stories? Words of caution? Oh yes! Moving my homework online has improved the percentage of pupils who do h.w dramatically! I use a wiki, never thought of using a blog for it. A wiki...I never considered that, but mostly because I have very little knowledge of wikis outside of wikipedia ;) How well does it work for you? The blog can be limited at times. 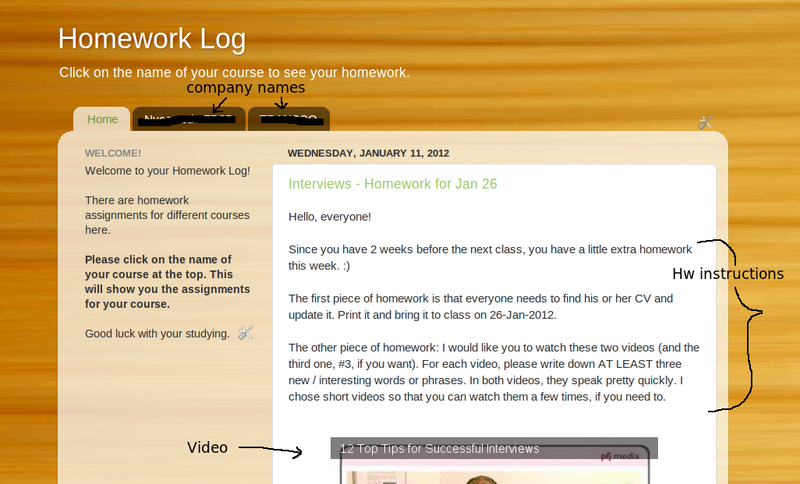 You will see four homework groups on the sidebar. I use it as a site, not a collaborative authoring program.It is easy to add pages, upload and docs, pictures and links. And there support is good! That is a really nice set up. Thanks for sharing--I will look into making one of those to see how it compares!